Kristin: In November I attended a communications stakeholders meeting comprising representatives from science and research institutions from around Australia. 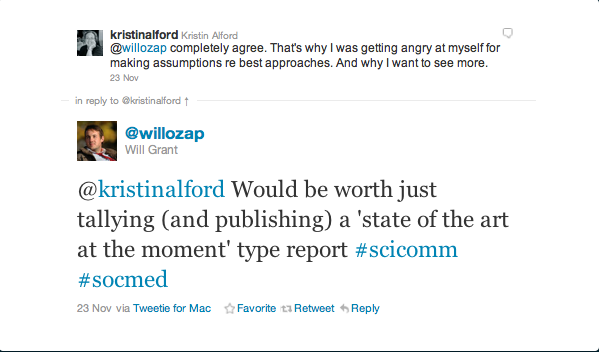 It struck me that again that different organsiations have different goals in undertaking science communications. And then it struck me, that while I am an avid and open user of Twitter, was it also that corporate Twitter accounts needed to have an identifiable personality, someone to connect with? 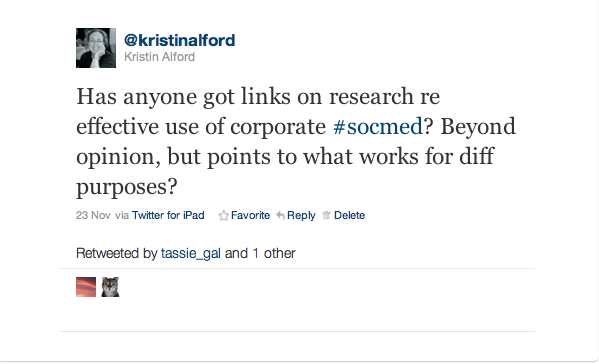 What were good social media practices for science organisations? Will Grant (@willozap) then set up a Google spreadsheet and @nwynn,@ScientistMags, @mjberryman, @matt_levinson, @cobismith and@ben_hr started to contribute by gathering evidence of science and research organisations and their participation in social media (focused on Twitter and Facebook). We’d kick-started a research project including data collection over Twitter and in less than 3 hours. Since then, information has been gradually added to the site and Will and I have had further discussions over beer and Skype to think further about what this research project might investigate and how it might be helpful. We’ve also been thinking about appropriate channels for publication and participation. Our study will explore why science and research organisations (universities, research instituions, museums, government bodies and others) participate in social media. We will interview them and collect data illustrating how they participate to see whether there are good practices that can be shared. Outputs will include a journal paper, as well as informing blogs, presentations and workshops. We will undertake the research over the next 3 months. In doing this, we’ll have the added benefit of testing the effectiveness of collaborative research networks formed via Twitter. Anyone can participate by adding data to the collaborative spreadsheet and you will be credited with an acknowledgement in the paper. Participants are welcome to use the data and findings to inform their own research and commercial work. If you’re happy with this and want to take part, email Will Grant and he can link you to the spreadsheet. If you’d like to participate and want to be more involved in the process and journal-writing, also email Will Grant and we can work out something together.